Where Did You Get Your Gray Tufted Chairs? You obviously do too! And, you’d love to know where you can buy them! Here’s a look at my chairs spring, summer, and fall. They are such a nice neutral and they are so comfortable too! Here’s the story of where I purchased these amazing chairs. A few years ago I was in TJ Maxx and saw on of these beauties! I was looking for new armchairs, but that isn’t why I was in the store. But, as soon as I laid eyes on this chair, I knew it was the chair style I wanted in my living room. I texted Mark and sent a pic by phone to him. He really liked it too – probably because of the color. At that time I still had three grown guys plus Mark living at home and I think Mark thought they would look good and the color choice really suited our home. But, there was a problem. The TJ Maxx store only had one chair and I really wanted two matching chairs for the living room. There was a friendly store clerk nearby and I told her my problem. She was so sweet and asked me how far I was willing to drive for a match if she could find one for me. I told her 100 miles. So, bless her heart, she went to the store phone directory and started calling other TJ Maxx stores in a 100 mile radius! I shopped and wished while she made the calls. It wasn’t too long before she found me and told me she found one! Can you even believe it! And, it was only about 50 miles away! The other store put my name on the chair and held it for me until the next day. I called Mark and he drove his work van down to the local store where I was to pick up the one they had! And, he drove to the second store the next day to pick up that one for me – I know, he’s THE BEST! So, I’ve had these chairs for four years now and they still look like new. They’ve really held up well and have a sturdy high back that I love. One thing I will mention is that the legs on the chair were originally a blond wood and I used a gel stain in walnut overtop so the legs would work with the dark wood tones in my room. So, here’s the problem. I’ve searched high and low to find these chairs online so I can give you a source to buy your own. Unfortunately, I’ve only occasionally found this chair online and then it sells out right away. 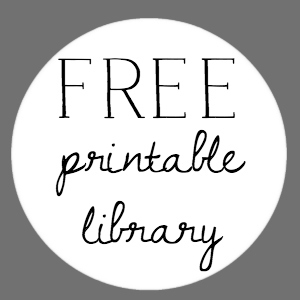 So, I have compiled a resource guide of similar chairs to mine and I hope you find it useful. This first chair is from Joss and Main and is similar in style to mind. Except, I just noticed that it doesn’t seem to have a separate seat cushion. And, the most noticeable thing is the color – it’s a light gray. But, as far as design, it is probably the most similar. Notice the tufting on the inside arms – it’s the only one I could find online that had that feature like mine. You will probably say – wait, this chair doesn’t look like your chairs at all. No, it doesn’t. But, I’m including it because this was the chair I was planning to purchase before I spotted the chair at TJ Maxx. It’s from World Market and has good reviews. 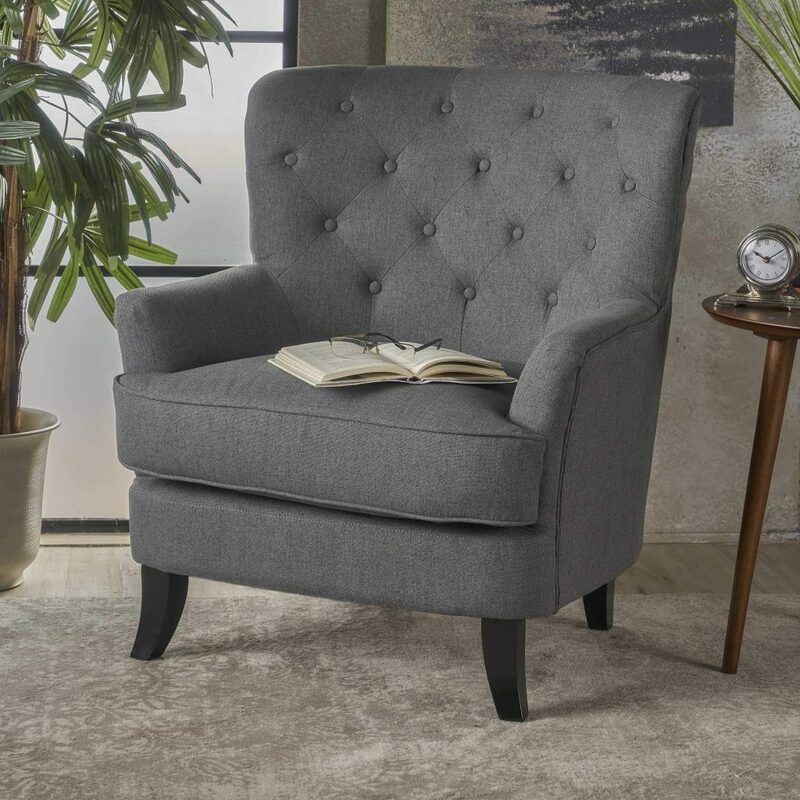 I really like the look and style of this chair and the gray charcoal upholstery is very similar to the chairs I have now. 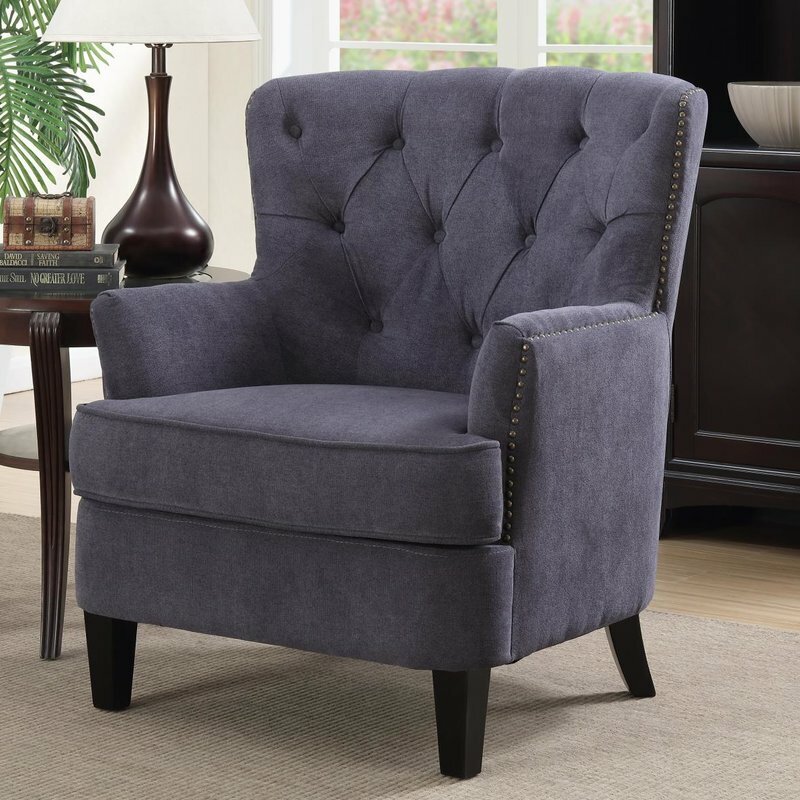 This chair from Wayfair is nice. It has some nailhead trim on the sides, but not too much. 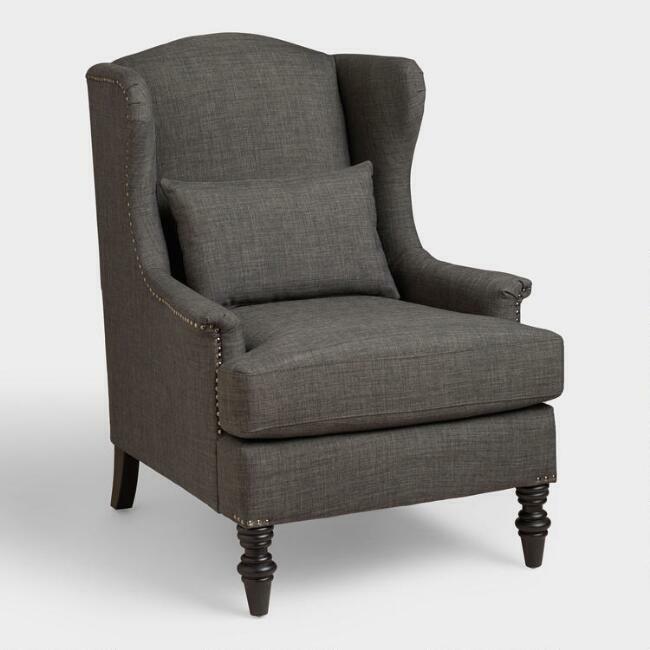 It doesn’t have the arm tufting like mine and the shape is a little different – but, it’s a nice charcoal gray armchair. 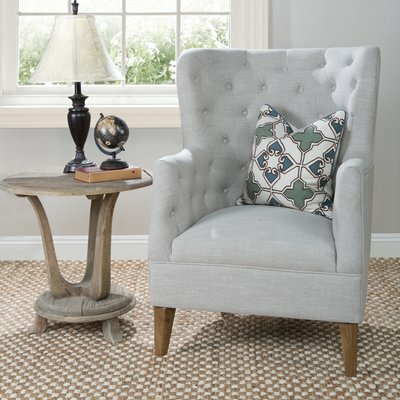 This chair from Overstock is very similar in color and style. Again, it doesn’t have the tufted inside arms. And, there’s the legs are turned outward. This sweet chair from Pier One caught my eye. I really like the shape of it, even though it’s not like mine. It is a chair that I would buy. 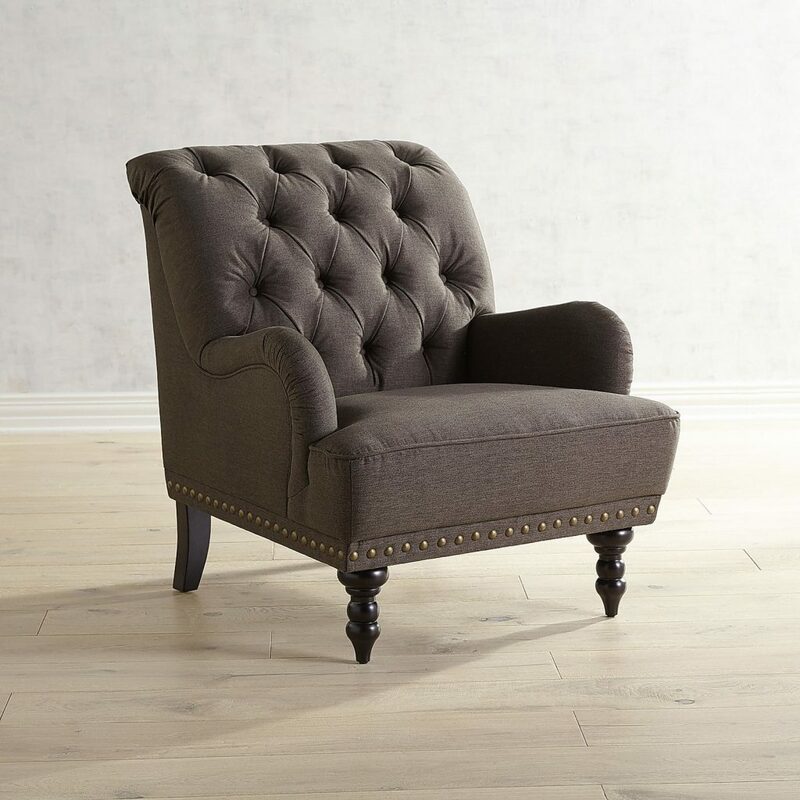 I like the nailhead trim around the bottom and really like the turned legs. It’s a beauty! I had to check Target and found this set. It’s a nice option because it comes with the matching ottoman. It also has subtle nailhead trim, but not too much! Can you tell I’m not a huge fan of lots of nailhead trim! 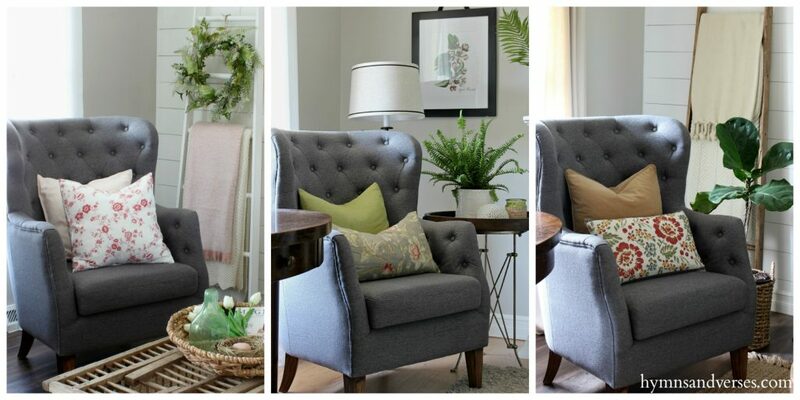 So, these are all options I would consider if I hadn’t been lucky enough to find the gray tufted chairs I did at TJ Maxx. You can shop at TJ Maxx online now, and I would also look there from time to time to see what chairs they have in stock. 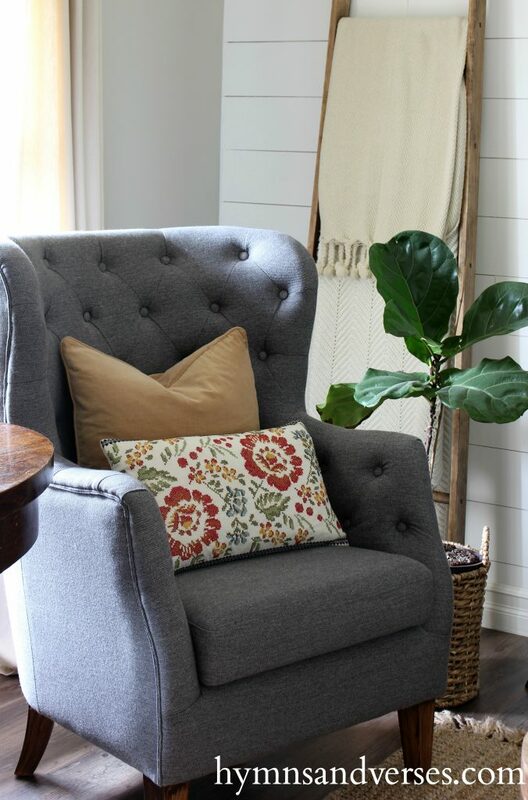 I will say that since I purchased my chairs, I have seen this style often at TJ Maxx, HomeGoods and even Marshalls. I see it most in a natural fabric, which is lovely as well. But, again, they don’t last long in the stores either! I’ll continue to try to source these chairs online for you and if I am lucky enough to find the exact chairs – I’ll be sure to update you all! Until then, if you are looking for some charcoal armchairs for your home – these options are good ones! Although I am not interested in the chairs, I just wanted to tell you how precious I thought you were to go to all of this trouble to research this for your readers! They are all lovely to me. That was so nice of you to do all the leg work in shopping for your viewers. Thanks and again I always love coming to your home. Thanks so much, Linda! 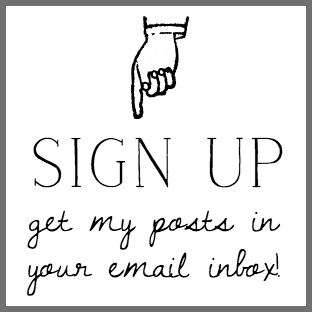 Love to hear from you! Where did your red and white Christmas pillows come from? Hi, Debby. 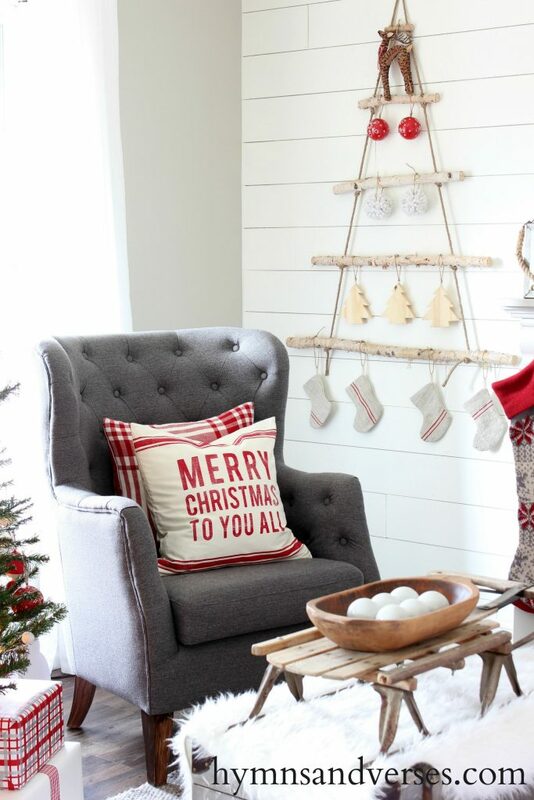 I made the red and white plaid pillow cover and I bought the Merry Christmas to you all pillow cover from H & M Home last year. They may have it again this year. 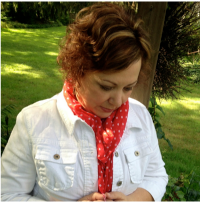 What a wonderful blogger you are! These are great options and good chair sources too. I like how you have all the information and then put all the chairs in a “group photo” so that we could compare them side by side too. Thank you! Would you mind sharing the height and width of the chairs?! I’m on a crazy search for ones like these but they all keep ending up looking too short. I love the height of yours! Thank you!!! 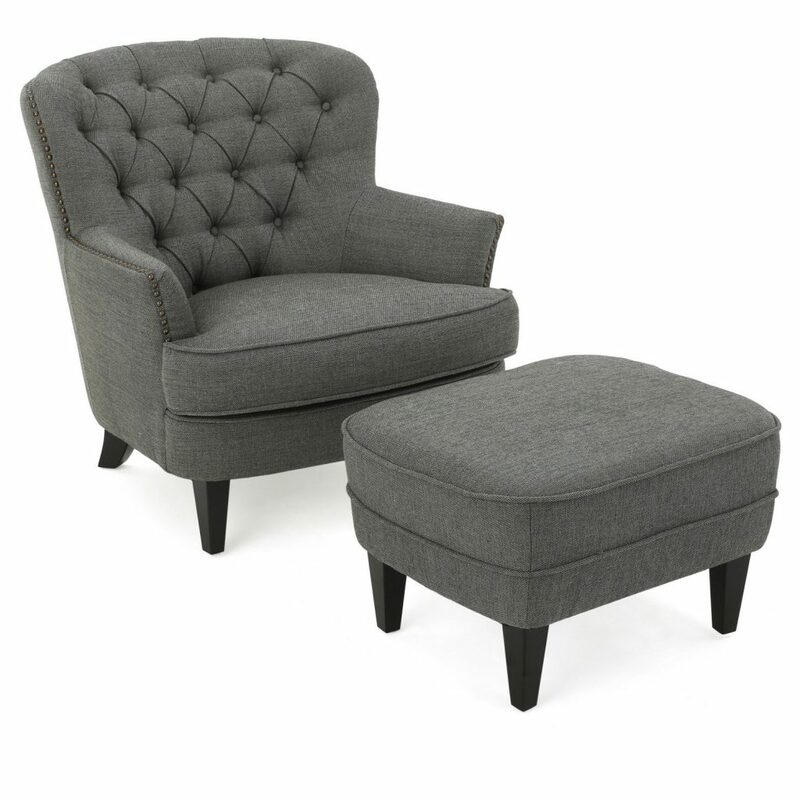 I’m not sure you subscribe to my emails, so I wanted to let you know that I spotted a tufted gray chair like mine at my local HomeGoods yesterday for $250. It had already been sold and was sitting at the entrance for pick up. I also checked my chairs for any tags/writing. I took pics for you of those too. Both of my chairs have identical tags on the bottom – even though I purchased them from two different TJ Maxx stores! I hope this all helps in some way! Good luck finding the chairs and I’ll keep your information if I find anything else!